The plan: A stretch of the Tahoe Rim Trail on the east side of the lake, heading south from Spooner Summit to South Camp Peak. 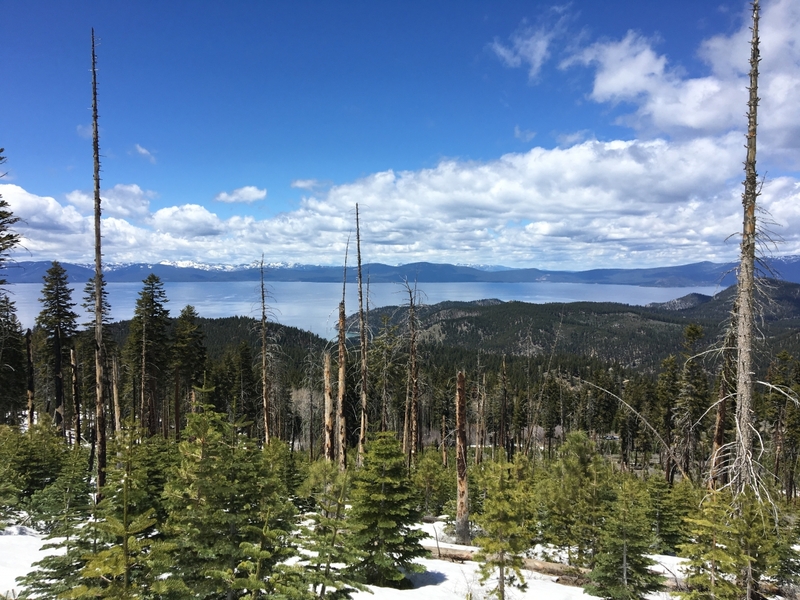 Per Mike White, a 10.4-mile out-and-back to the plateau of South Camp Peak, yielding some of the best views of Lake Tahoe. This marked the first day hike of the spring with Shannon, the one for whom I have forsaken all others. The weather was perfect – sunshine but a little on the cooler side. We both wore pants and long-sleeved shirts. But, it still being spring after an above-average winter, there was still snow at the higher elevations. So, even though it’s completely too much for a day hike, I packed it up with a few jackets, a full bladder, a few liters of water for the dogs and some other snacks and whatnot, to try it out. It probably had 12-15 pounds in it, but it felt like nothing. We’ve got a couple of backpacking trips loosely planned later this year, so I may do this again just to continue to get used to it. The trailhead is on the south side of Highway 50. There are probably a dozen parking spots there, and more available for the TRT heading north in another lot on the north side of the highway a quarter-mile or so west. We were on the trail by 11:30 a.m. The trail moves quickly up and away from the highway and associated noise by way of a handful of switchbacks. Within 15 minutes, the traffic noise was gone and we were surrounded by trees, with glimpses of Spooner Lake off to our right. About a mile or so in, the first views of Tahoe present themselves. The sky was mostly clear and the lake was beaming bright blue through the trees. As the trail winds on, there are some neat views of the Carson Valley to the east. We took a quick break at the first of two fire road crossings, two-plus miles in, to give the dogs some water. Back on the trail, we started hitting patches of snow as we moved toward the second dirt road, Genoa Peak Road, which is about three miles from trailhead. As we crossed the road and started gaining ground again, the snow patches started to get bigger. Soon we were hiking through 30- or 40-foot-long stretches of snow. More than once, it took a minute or two to identify the trail again after slogging on top of snow. We reached a clearing of sorts that brought about some terrific views, so we paused for a few pictures. We were about four miles in and a mile from the plateau of South Camp Peak. A glance south showed more snow than trail, and a check of the book said that the trail would soon bend back east and switchback up the slope. The decision to end it there was fairly easy. We cruised back on a smooth pace, stopping once more to let the dogs drink. We were back at the trailhead around 2:30, marking about three hours for an eight-mile(ish) roundtrip. Overall, it was a good hike and one we’ll do again as I want to get to the plateau and get the full views of the lake. I also have intentions of being on every inch of this trail. I’ve done a couple of other segments in the past and I hope to catch up on them here at some point. But I also have a thought it my mind to backpack this trail at some point as well. Gear: Other than the big pack, nothing out of the ordinary. I go back and forth between an old pair of low-top Columbia hiking shoes and these Under Armour lightweight boots that I wore for this hike. Per usual, I forgot my hiking sticks. Post-hike beer: We hit up a favorite spot of mine in Incline Village, Alibi Ale Works, en route back to Reno. Shannon had the Imperial Stout and, at 8.8 percent, that was it for her. I tried the Purple Rain, a boysenberry Berliner Weisse and then the collaboration saison they did with IMBIB. Both were excellent, as was the half-growler of IPA we took home with us. If you haven’t been to Alibi, check them out. They have a handful of core offerings, and everything else is probably a new creation.